Set in a most magnificent location in the spice growing hills of Kerala about 5-6 hours drive from the nearest railway station/airports. Set in very green hills on it's own piece of land in a pristine area, Sree Sanakar is an ideal location for all kinds of treatment. The hospital was established as the flagship of their hospitals and caters mostly for German clients at present. The setting is very beautiful. The drive to reach there is long and winding but well worth it. Walks around the centre are very beautiful. All doctors are working under the Sree Sankara group and have got good qualifications. There is a network of senior doctors to access for more difficult cases. The focus of Sree Sankara Gardens seems more on rejuvenation than on their main hospital in Changanachery which si more clinically focused but the resources are there to do vey deep treatments in Kumali. Recently two Kutir Praveshika treatments were performed there showing that very good Vaidyas are avaialble. Each bedroom has it's own spacious treatment room. Very perfect for receiving all treatments. High. Rates are European targeted packages. Well worth it for the setting and quality. Meals are lovingly prepared under the doctors supervision. It would be great if there was organic foods, they do have a food garden in process but there is not much coming out of it. Rooms are spacious and very comfortable with a simple decoration. Design is North facing with a nice sort of courtyard. Some awareness has been given to Vaastu and you feel it nicely. ""Sree Sankara Gardens" is set in the scenic environs of Kumily, the "spice garden" of India. Nestling on a hill lush with vegetation at an altitude of 1200 mts., this is a bird watchers' paradise. 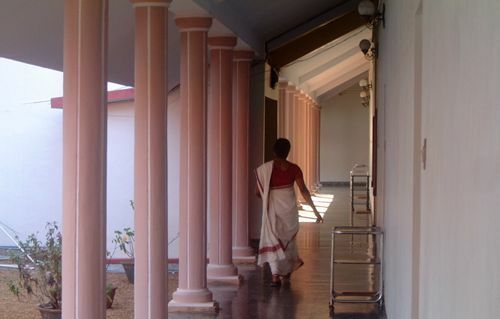 The design of the edifice is the traditional Kerala style. It consists of 10 spacious en suite apartments, each with individual treatment room and private sit-out. This secluded retreat also houses a yoga hall, a performing arts centre and an exclusive kitchen serving traditional Ayurvedic vegetarian cuisine. Modern amenities such as telephone and internet are made available sparingly but sensibly so as not to disturb the tranquility of therapeutic experience. In spite of the large expanse of the campus only small groups are taken at a time in order to maintain a homely and personalized atmosphere. The calm and tranquil setting, the cool climate, the invigorating fresh air and the insulation from all distractions, is the ideal environment for inspiration and healthy rejuvenation. The holistic experience is aided by physical and mental exercises designed to sharpen the concentration, invite introspection, foster peace of mind and improve health." I stayed there with my wife a year back and the setting is out of this world. The entire experience was very positive being luxurious but simple and almost family run. A rare combination. Each bed room has a treatment room which is very good. The treatments were very well done, it gets quite cold in Kumali so sometimes it was cold on the Droni (massage tables) but the therapists, cooks and all workers there are in a very loving mode. There is a senior doctor who visits regularly for more serious cases. When we were there they were doing a Kutir Praveshika treatment for a Russian lady. It is good to see them researching these beautiful ancient Rasayana treatments. I stayed there with my wife a year back and the setting is o ..